Over the weekend I visited the Museum of Contemporary Art (MOCA) in downtown Los Angeles for the first time, along with my daughter and my parents, who were visiting from Cincinnati. 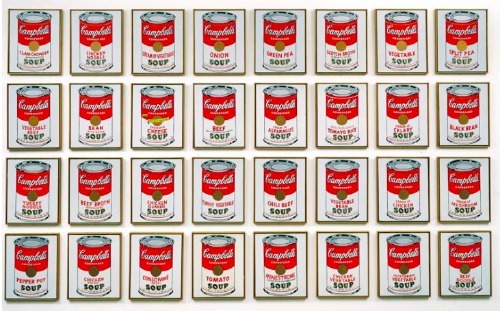 We enjoyed the collection, which included the visiting exhibition Campbell's Soup Cans by Andy Warhol (I didn't know he'd painted so many, 32, ranging from the common like "Tomato" to the more unusual like "Pepper Pot"). "Mom, it's SOUP," she said, unimpressed. She liked a large Jackson Pollock work with multi-colored drips of paint meandering in countless directions. The permanent collection represents good sampling of work by some of the most famous contemporary artists (works made since 1940), including Roy Lichtenstein, Jackson Pollock, George Segal, and a lot more. After strolling through some dozen chambers, I was becoming immersed in the out-of-the-box nature of this art: colored strings on the ceiling that produce an optical illusion; canvases with long splatters in many colors; photos from the '50s; sculptures that looked like blobs of people parts or clumps of trash from an office complex. Look, those carpeted steps lead nowhere! And is that a chair, painted onto a sort of…chair? I was getting tired, both mentally and physically, when I noticed a bench in next room. Ah! I walked over and parked my posterior. "MOM!" said my 14-year-old daughter. "Get up, get UP, that's a piece of art!" "Oh no!" I shot back up to my feet, embarrassed and concerned that I'd sat on a piece of art. I turned to my daughter, who was laughing hysterically. Anne, I love it, that's hilarious! When I tried the URL, the shape looked something like a violin. I wondered how Anne could be so clever. My computer cleverness is limited to the "on" button. That is not my work! Neat site though. I was never a fan of Pollock until I got to see some of his paintings in person. A photo doesn't quite capture the energy, colors, or scale. Maybe seeing art is a little like hearing music? Examining a Pollock in person, in a curated room with optimal light, jockeying around for different angles and distances is surely better than glancing at a reproduction, online or on a dead tree. Hearing a piece performed in a great hall, with the best musician(s), using the best instrument(s) available, in the context of a thoughtful program, is surely better than staring at a tiny box on the youtube, with compressed sound pushed out of cheap speakers. I agree, Anne, the one we saw was really impressive, it was so large but full of energy, color and direction. And paint drips! We stood there a good long time. We take things for granted, the way they can be so very easily replicated a million times over. And yet, there's only one painting that is that painting, an actual object in the world.